The participants of the meeting considered issues of formation of Ukraine’s trade policy and financial support of exporters, and decided organizational issues regarding the admission of new members of the Export and Investment Support Committee at the Kyiv Chamber of Commerce and Industry. Speakers of the event were Sergiy Kostyukov, Chairman of the Committee for Export and Investment Support at the Kyiv Chamber of Commerce and Industry; Boris Sobolev, First Deputy Minister of Foreign Economic Relations of Ukraine (1990-1993); as well as Igor Pulvas, acting director Chairman of the Board of PJSC “Export-Credit Agency”. According to the results of the work, a working group was created to study issues in the field of financial and export activities and to solve problems of training specialists in the financial and export industry. 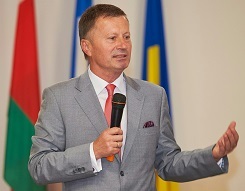 The League of Insurance Organizations of Ukraine at the event presented the President of LIOU Oleksandr Filonyuk, who stressed that an effective system of insurance and export credit guarantees would reduce the risks of Ukrainian exporters and should become an important tool for the development of national exports. The Committee on Export and Investment Support at the Kyiv Chamber of Commerce and Industry has commissioned the working group to prepare an appeal to the Government of Ukraine in order to foresee funds for financial support of producers of goods and services with high added value as well as training specialists in the field of financial and export activity in the next budget year.